Northmor's Anna Donner throws down one of her 17 kills of the night on Tuesday against Columbus Academy. The Lady Knights won in straight sets to advance to the sectional championship game. Jordyn Zoll was the primary set-up player for the Northmor attack on Tuesday night against the Lady Vikings of Columbus Academy. Zoll finished the contest with a well-rounded stat line to assist in the Knights' victory. Cristianna Boggs attempts a kill during Tuesday's sectional playoff contest against Columbus Academy. The Lady Knights would defeat the visitors to advance to the title game against Northridge on Saturday. 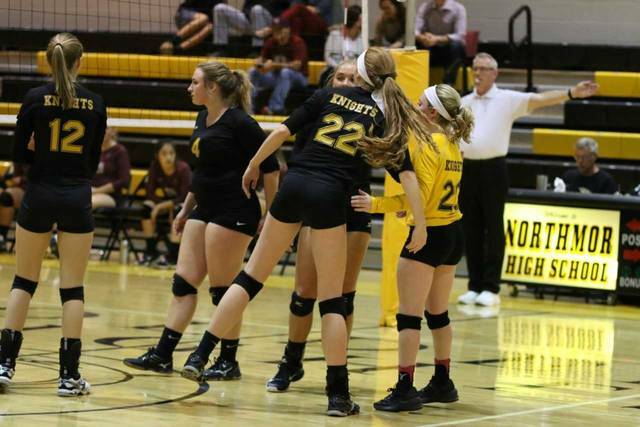 The Northmor Lady Golden Knights volleyball team defeated the Columbus Academy Lady Vikings on Tuesday evening in sectional playoff action. With the win, Northmor advances on and will look to capture the sectional championship on their home floor against Northridge on Saturday. GALION — On Tuesday evening, the Northmor Lady Golden Knights, a four seed, began their postseason run on their home court against the No. 22 seeded Columbus Academy Lady Vikings. Northmor would improve their record to 18-4 on the season, defeating Columbus Academy in three sets; 25-14, 25-9, 25-12. The home team would start the first set of the night with a 1-0 after a Vikings service error but Columbus Academy tied the contest up on a kill. The Vikings would take a 2-1 lead after a rotation foul by the Knights, which would turn into a tie after an Anna Donner kill. Northmor took a 3-2 at that point and would not trail the visiting Lady Vikes until the first point of the third and final set. Throughout the first set and for the duration of the contest, the Lady Golden Knights would utilize long stretches of service points, in conjunction with a well-rounded setting and attack game plan, to prevent the visitors from coming within striking distance. Also throughout the evening, Columbus Academy would have problems staying out of the net and would see many of their kill attempts sail long and out of bounds. In the second set, Northmor sprinted out to a five-point lead thanks in large part to the serving of Jordyn Zoll. After a timeout, Columbus Academy scored their first point of the set but would not score again until they made the score 9-2. The home team would proceed to go on a 13-3 run before the Vikings scored, making it 22-6 before eventually capturing that second set on another Donner kill. Columbus Academy scored the first point of the third set, their first lead since the opening set, but would eventually be erased on a kill by Zoll. Despite back-to-back aces in the set by the Lady Vikes, Northmor would continuously distance themselves from the visitors and cruise to the game, set, match win to advance in the tourney. Serving statistics for Northmor were: Kelsie Fike- 16/16; Cristianna Boggs- 8/8, ace; Donner- 12/12, ace and Lily Tate- 8/8, ace. Offensive stats for the Lady Knights were: Donner- 30/31 hitting, 17 kills; Leslie Brubaker- 10/12 hitting, 6 kills; Zoll- 9/10 hitting, 5 kills, 56/56 setting, 24 assists; Caitlin Thebeault- 4 kills, 26/26 setting, 11 assists and Hope Miracle- 4 kills. Defensive statistics for Northmor were: Boggs- 14 digs; Donner- 7 digs; Aly Blunk- 6 digs; Brubaker- 5 blocks and Thebeault- 2 blocks. Another Lady Vikings opponent now awaits the Northmor Lady Golden Knights. Northmor will be back at it, competing for a sectional championship on Saturday, Oct. 21. The Knights will play host to the No. 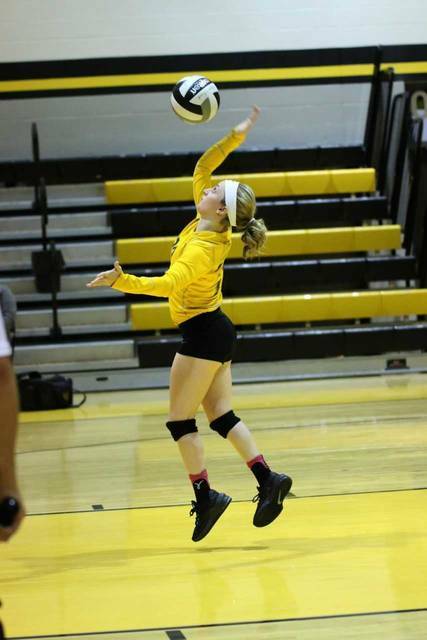 20 seed from Northridge High School at 2:30 p.m.
Northmor’s Anna Donner throws down one of her 17 kills of the night on Tuesday against Columbus Academy. 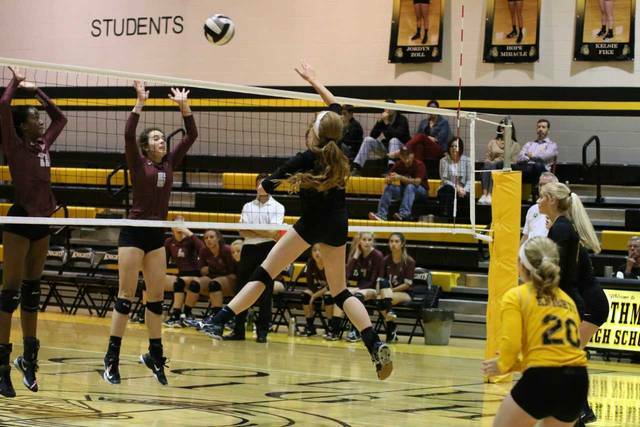 The Lady Knights won in straight sets to advance to the sectional championship game. https://www.galioninquirer.com/wp-content/uploads/sites/38/2017/10/web1_Anna-Donner.jpgNorthmor’s Anna Donner throws down one of her 17 kills of the night on Tuesday against Columbus Academy. The Lady Knights won in straight sets to advance to the sectional championship game. Jordyn Zoll was the primary set-up player for the Northmor attack on Tuesday night against the Lady Vikings of Columbus Academy. Zoll finished the contest with a well-rounded stat line to assist in the Knights’ victory. https://www.galioninquirer.com/wp-content/uploads/sites/38/2017/10/web1_Jordyn-Zoll.jpgJordyn Zoll was the primary set-up player for the Northmor attack on Tuesday night against the Lady Vikings of Columbus Academy. Zoll finished the contest with a well-rounded stat line to assist in the Knights’ victory. Cristianna Boggs attempts a kill during Tuesday’s sectional playoff contest against Columbus Academy. The Lady Knights would defeat the visitors to advance to the title game against Northridge on Saturday. https://www.galioninquirer.com/wp-content/uploads/sites/38/2017/10/web1_Cristianna-Boggs.jpgCristianna Boggs attempts a kill during Tuesday’s sectional playoff contest against Columbus Academy. The Lady Knights would defeat the visitors to advance to the title game against Northridge on Saturday. https://www.galioninquirer.com/wp-content/uploads/sites/38/2017/10/web1_Lady-Knights.jpgThe Northmor Lady Golden Knights volleyball team defeated the Columbus Academy Lady Vikings on Tuesday evening in sectional playoff action. With the win, Northmor advances on and will look to capture the sectional championship on their home floor against Northridge on Saturday.